Souvenirs are like tiny memory capsules for me. When I hold the object in my hand I am instantly taken back to the moment of purchase. My favorite souvenirs are earrings – small, easy to carry, and as unique as the market in which they were purchased. Earlier this month we moved into a new house and as I unpacked my earrings one by one to put them in my jewelry box I took a trip down memory lane. Wooden beads from Bolivia, earrings made of cowrie shells from Africa, and finally a set of hammered copper earrings from Prague. If you’ve never been on the Charles Bridge it is famous for the numerous statues of saints that line the bridge. Connecting the two sides of Prague, the Castle looks over the bridge, giving the whole area a medieval feeling. It’s also covered in buskers, artisans, painters, and any kind of performer you could ask for – it’s almost like a carnival during peak season as hordes of tourist move from one side of Prague to the other. Many hotels in Prague offer city tours that include the bridge, so you also have a lot of tour guides stopping along the way giving a historical perspective on the bridge, the statues and the city. Holding the earring in my hand I was taken back to a very sunny day along the Vltava when we climbed to Prague Castle, picnicked in the park, watched street performers do magic, visited the clock tower, and did the traditional “tourist” Prague experience. It was an unusual day for the two of us, who generally like to stay off the beaten path. The rest of the time in Prague we did get off the beaten path, exploring neighborhoods, visiting outlying areas to see soviet era architecture and taking the Prague metro everywhere. After several moves and three kids only one of the earrings remains in my jewelry box, but the memory of Prague lives on every time I hold it. Beloved all over former Czechoslovakia and Hungary dumplings are the national dish. 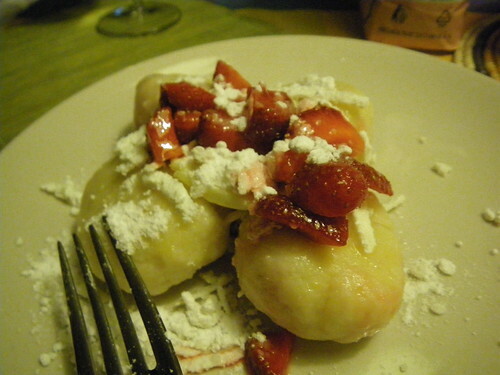 Arriving in Prague, we were treated to a meal of strawberry dumplings by our couchsurfing hosts. Simple and easy to make, I helped our host in the kitchen, measuring ingredients on his grandfather’s old scale before filling them with fresh strawberries. We normally think of berries as dessert or a side dish in the US, but in the former Austrian empire they are commonly used as filling for dinner dumplings. My first thought was that strawberry dumplings were something like strawberry shortcake. Wrong. Tasty, but light dough filled fruit balls, these dumplings were delicious, but not sweet like a dessert. Served with melted butter and salted cheese grated on top, the dumplings were perfect for a light summer meal. There are three varieties of dumplings, all of which are so common, I’ll liken them to meatloaf since everyone probably thinks their mom’s is the best! Fruit dumplings, described above, are eaten as a main dish and traditionally are filled with plums or apricots. Bread and potato dumplings on the other hand are eaten as a compliment to a meat dish, like goulash. Unfortunately the bread dumplings I had were rather heavy and bland, only palatable when soaked with goulash. They left me feeling stuffed in an uncomfortable way. Maybe I ate them at the wrong restaurant? 1.Sift flour, salt, and baking powder. 2.Mix egg and milk and add to dry mixture. 4.Cut dough into several small pieces (large enough to cover two whole berries). 5.Place fruit over flattened dough piece and seal tight around fruit. 6.Place dumplings into boiling water and cook for fifteen minutes, covered. 7.Remove from kettle and place on platter to dry and cool down slightly. 8.Serve with melted butter and cinnamon sugar. Let me admit one thing-there are places we’ve gone on this trip which I never planned to go. Not that I didn’t have a good time, just that they weren’t high on my “must do before I die” list. You can probably imagine the places. Then there are the places I wanted to go that Danny didn’t and vice versa. Prague was on a third and more select list: places we both were dying to go. So, did Prague live up to its expectations? In one word, yes. Although the weather was awful and the only day with sunshine was the day we left, we still loved the city. 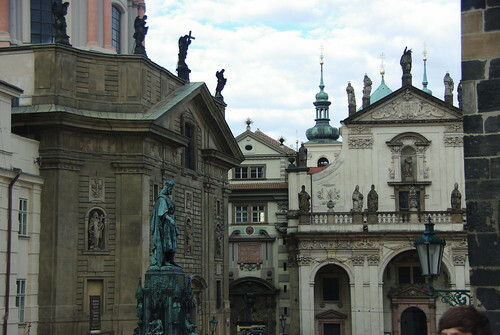 Without a doubt architecture and culture are what make Prague beautiful. Fortunately the center of Prague wasn’t damaged as badly as other European cities during WWII, so much of the original buildings and work still stand. I happen to be a huge fan of Art Nouveau, which left me usually looking up instead of down, studying the beautiful and ornate buildings around me. Not all of Prague is nouveau though and we had plenty of time to explore the Castle and its surroundings. Unfortunately several sites within the castle were closed on our visit, so we didn’t get to see some of the main attractions. The famous clock was running though, and although the show was a bit “boring” by modern standards, the skeleton shaking the bell did make us crack a smile. 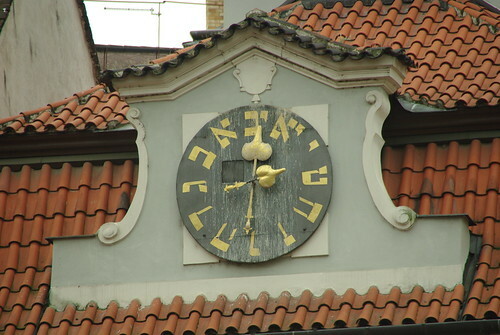 The history of Prague is a long one though, and the Jewish Quarter tells a long story of the Jewish presence in Bohemia. No where else have we seen Jews intertwined so much with a cities identity and history. For us it was remarkable to see not only historical synagogues, but also the various examples of Judaism’s influence in the culture and architecture of Prague. Like the rest of Europe, a large percentage of Czech’s Jews were killed during the Holocaust, but their legacy lives on in the buildings and monuments around Prague. 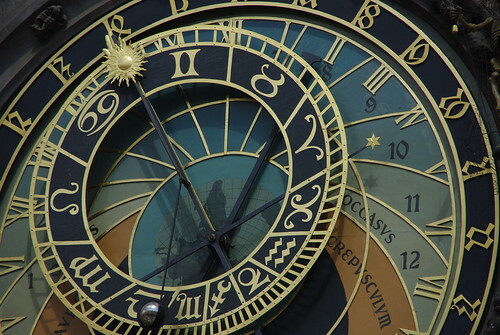 Perhaps the most interesting part about Prague is it’s recent history. The first of a few former Soviet block nations on this trip, I was captivated by the recent revolution and the story of Jan Palach. A 19 year old student, Jan and his friends protested the 1968 Soviet invasion of Czechoslovakia by setting themselves on fire. As the first to go, Jan’s death sparked huge protests against the invasion and he became a martyr for freedom in Czechoslovakia. In his memory, anti-communist demonstrations continued in Prague until the Velvet Revolution in 1989. At the day we visited a memorial to him and another student, there were flowers and candles at the site. What struck me the most about their story wasn’t their bravery or their fight against tyranny, it was that the students, more than 40 years later are still recognized as national heroes for taking a stand against their occupiers. To me, that says a lot about the character of this country. No matter how exciting March Madness and the NFL playoffs might be, they simply do not compare to the pandemonium that is the World Cup. The only thing that comes close, for us as Americans, would be the summer Olympics when we all check the paper each morning to review the updated medal count. Even still though, the Olympics are diffuse with more sports than anyone can name, different a different sports hero to match each person’s taste. The World Cup is nationalism at an entirely new level. As we traveled through Germany during the start of the World Cup we watched as all of the people we met prepared and posted their brackets, naturally all showing Germany going all the way. It was the first time, many told us, that they felt they could cheer for Germany and show their national pride….the first time they were allowed to put it on display and be excited together. When Germany trounced Australia in their first game the honking horns could be heard miles away. As we’ve continued traveling, the Cup has been in our faces 100%. 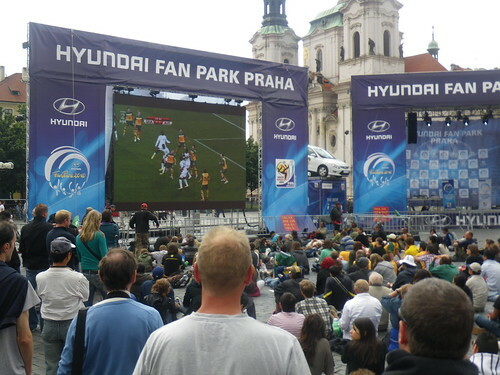 Walking into Prague’s central square for the first time we could see the Aussie fans holding on for just one win while the rest of the crowd was clearly pulling for Ghana. The next night we didn’t even need to be able to see the enormous screen to know when Brazil scored each of its 3 goals against the Ivory Coast. When the US lost its fateful match to that same Ghana team, people in Budapest stopped us on the street when they heard our accents to commiserate with us. One British man was getting ready to watch his big game against Germany. His wife was German. 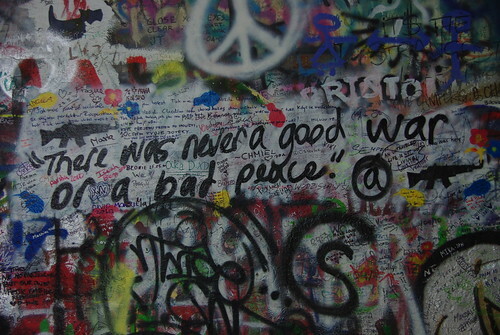 One of them was watching in Buda, and the other watching in Pest, they were not watching together. (Yes, Budapest is actually divided in half!) We caught the score as we walked past a giant screen at the entrance to a shopping center, we were going to buy groceries. We don’t have very many ‘rally round the flag’ events in the US. We are so big and so diverse, we handle most of the competition within our borders. Think of the last time your team (if you come from Florida and have the Miami Hurricanes and Florida Marlins, this is an easy task) was in the race to win and you joked with that guy at work who roots for the Yankees because he doesn’t know any better. A third co-worker was a Boston fan anyway and a fourth didn’t care. Now put all of those people for the same team, with everyone else you know, watching all the games together, in public places with beers in hand. Rooting and cheering and hooting and hollering. Add a few vuvuzela’s and that is World Cup. Franklin himself spent two months in Germany, and although his love of beer is legendary, I’m curious what kind of beer he actually had on his trip to the country. I say that because everywhere we go, each of the 16 states, (Länder in German) each city, each town, and seemingly each house, has its own kind of beer. In some places it is a re-bottling of a familiar taste under a new label and in others the choice of beer is as important as the language you speak. We started our time in Berlin drinking Berliner amongst other things. Generally a pilsner like beer but not from the Czech region by that very name…it gets a pass in my book on enjoyment factor….especially given that as we drank them at room temperature no one (including your two favorite bloggers) realized that they hadn’t been refrigerated. 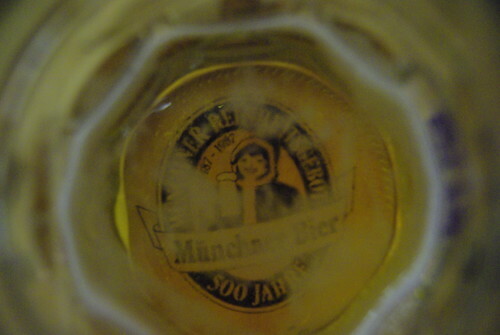 Munich would be the place to put our beer drinking skills to the test. After being in town only a few hours we found ourselves seated inside the infamous Hofbrau Haus with one of our hiking mates from Mt. Kilimanjaro. 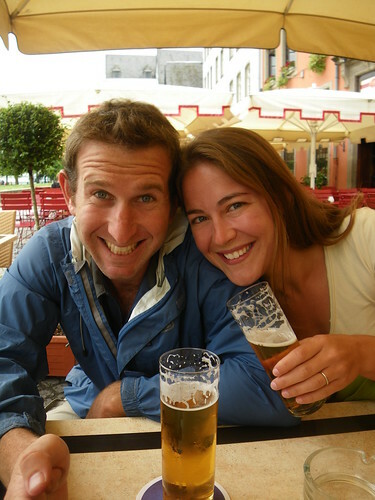 She and I each had a liter of the local Augustiner while Jill went for a smaller and more refined hefeweizen, later deciding to go for a second half liter in order to catch up. She somehow combined the German word for one (Ein) with the Spanish word for more (mas) but quickly learnt that ‘masse’ in German is the word for ‘liter’ instead of ‘more’….needless to say she needed a little bit of support to finish her ein masse (one liter) which was not hard to come-by. The beer doesn’t end with Germany though, in fact it merely just continues everywhere we go. In Prague, passing through the town of Plzen we caught a quick glimpse of the Pilsner Urquell brewery on our way to Prauge. We later learnt that Pilzner Urquell literally means “original source of pilsner“ in German…not even Czech. The most important brewery in the Czech Republic—to an American—is not its biggest exporter; in fact this brewery is able to export to a mere handful of countries. This is because the of a pioneering American by the name of Adolphus Busch, who visited the city of Budweis in the Kingdom of Bohemia, in 1876 and came home and set to work using the name and the style of beer in his home country. Budweiser is known to all of us in the States but tasting the true namesake was a special treat. The best part was the style in which it was served to us; a light pilsner styled beer mixed (as if they’d stirred a black & tan) with a darker lager. In Czech this is known as a ‘rezane’ and by all accounts was absolutely fantastic…certainly having nothing to do with the word Budweiser on the glass….